Guu Garden is a part of the Guu restaurant chain and is located upstairs in a building on Nelson Street downtown. They serve the same style of Japanese izakaya dishes that all the other locations serve. I came here recently for lunch with Dee from Gastrofork. Most of the other Guu locations are crowded, dark, loud, spaces, but Guu Garden has a much different atmosphere. All of the windows give it a bright, spacious atmosphere. 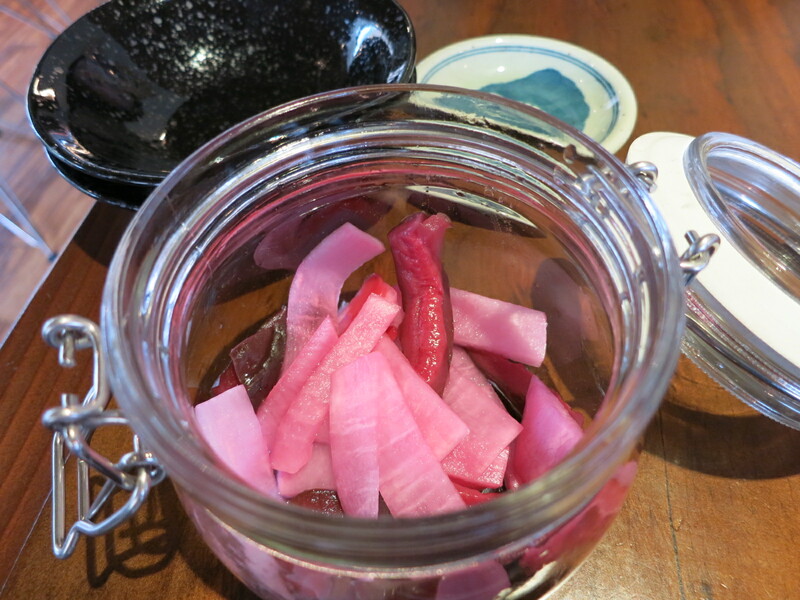 When we were seated we received a complimentary jar of pickled veggies. I always love complimentary snacks at restaurants and these were crunchy and tangy. Chicken karaage ($7) is one of the staple dishes I always get at any Guu restaurant. They serve it with a side of garlic mayo dipping sauce. This chicken was good, but not quite as good as other times I have had it. Usually it is more juicy, but I found it to be drier than normal this time. It was nothing that heaps of creamy garlic mayo couldn’t fix though. Ebi mayo ($9) is another dish I always get because you just can’t go wrong with it. This dish lived up to my expectations and tasted as great as always. 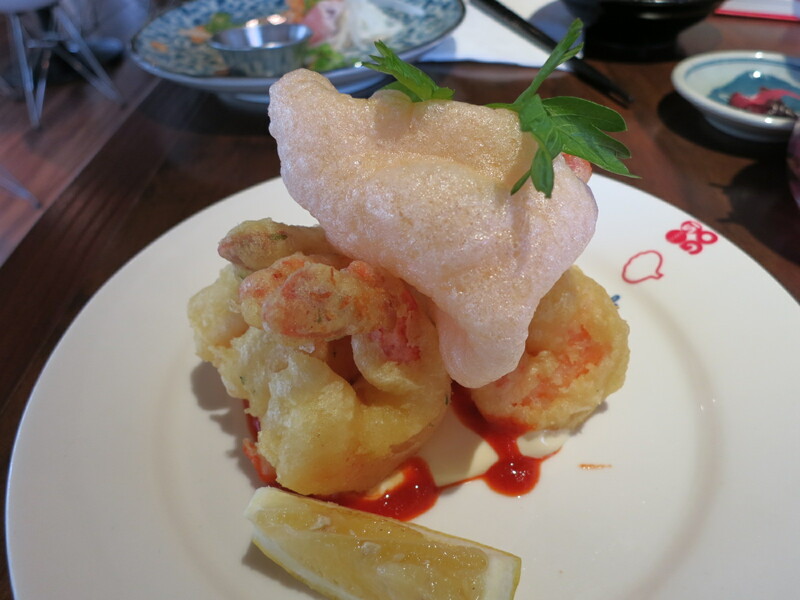 The prawns were hot and had a crispy batter. The chili mayo sauce also makes it extra delicious. We tried a dish that I haven’t had from Guu before, the kimchi bibimbap ($9.80). I’ve said it before and I’ll say it again, I love stone rice bowls. The smokey flavour and crispy texture that it gives the rice is just so much better than any regular rice bowl. This bowl was filled with pork, egg, and kimchi. I loved all of the elements and I would recommend ordering this dish. It is also nice and filling, which is good at a place like Guu because many of the other dishes are small. 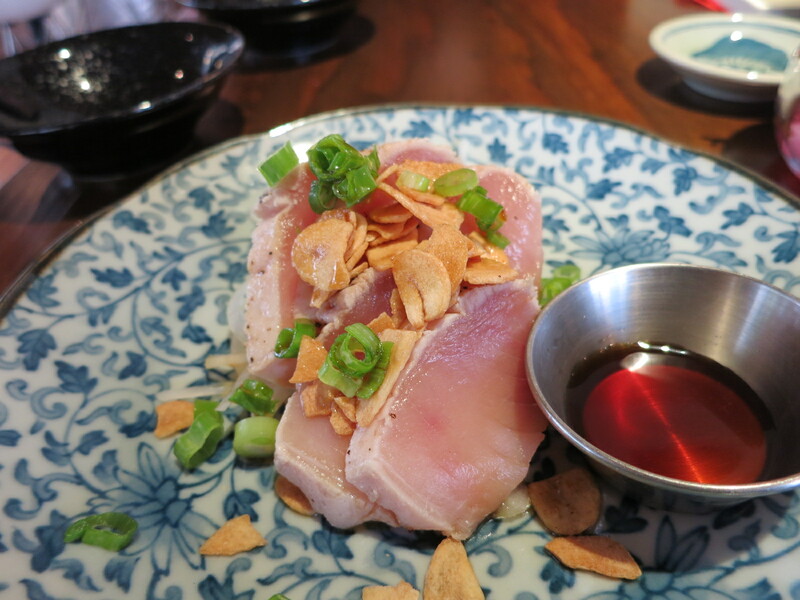 Lastly, we had the tuna tataki ($7.80). This was fresh tasting and had a nice thin sear on the outside. It was topped off with green onions and garlic chips and served with a side of yuzu ponzu sauce. This dish is pretty small for the price, but it was probably my favourite taste wise. The food from Guu is a bit pricy and small, but it tastes good. They always have a fun atmosphere and it is a good place to come with friends and share a bunch of dishes and try new things. If you want somewhere with a more relaxing atmosphere, I would recommend checking out Guu Garden. Yes, for good, standard, izakaya dishes.